A local resident of Syria's Afrin carries a humanitarian aid package from the Turkish Red Crescent, March 31. Turkey sends truckloads of aid to needy people in Syria every day, now that the normalization process in the war-torn country has accelerated, thanks to the recent offensives of the Turkish Armed Forces (TSK) that cleared the region from terrorists and provided peace. "The recent developments, namely the TSK's military operations in northern Syria and the agreement for a demilitarized zone in Idlib, paved the way for the humanitarian aid to be sent to the relatively safe areas in Syria," said Kerem Kınık, the head of the Turkish Red Crescent, one of the most prominent humanitarian aid providers to Syria. Speaking to Anadolu Agency (AA), Kınık added that the charity has been aiding the needy people of Syria from the very beginning of the conflict in 2011. He said that in almost eight years, 42,000 truckloads of aid have been sent to the country. Between August 2016 and March 2017 Turkey conducted Operation Euphrates Shield with the aim of eliminating the terrorist threat along the Turkish border with the efforts of the Free Syrian Army (FSA). Later, on Jan. 20, Turkey launched Operation Olive Branch to remove the PKK-linked People's Protection Units (YPG) and Daesh terrorists from northwestern Syria's Afrin region with the aim of providing national security, as well as to pave the way for Syrian refugees to return to their homes. Turkey's efforts to bring peace to the region continued in Syria's northwestern Idlib province. On Sept. 17 Turkey and Russia struck a deal in the Russian town of Sochi to ward off a Bashar Assad regime offensive on the last major opposition enclave in Syria and avert a possible humanitarian catastrophe. The deal set up a demilitarized zone running 15-20 kilometers that was supposed to be evacuated of all heavy weapons and all opposition groups. The deal also foresees that opposition groups in northwestern Syria's Idlib will remain in areas where they are already present, while Russia and Turkey will carry out joint patrols in the area. "The forms of aid are ranging from shelters to delivery of food and other basic humanitarian needs," Kınık indicated. "We are aiding some 6.5 million displaced people in Syria via our own facilities or with the help of international NGOs or organizations such as the U.N. We send 20-25 truckloads of humanitarian aid daily to Syria. By this year, we will help 30 million people," Kınık added. Nearly eight years have passed since the brutal war in Syria began, and within this period hundreds of thousands of people have faced forced displacement, either within the country or have had to seek shelter elsewhere, neighboring Turkey being the first choice. 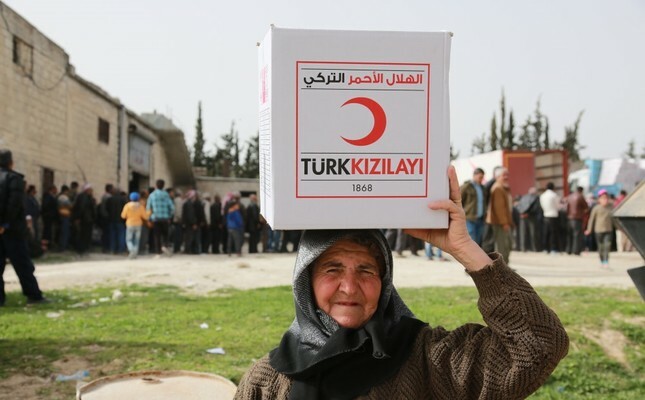 The Turkish Red Crescent not only provides humanitarian aid to Syria but also creates multidimensional opportunities for more lasting solutions, including agricultural encouragement, building permanent dwellings and health care delivery. Saying these works create a healthy atmosphere in a country faced with, and still facing, serious consequences of war. Kınık also stated that these are important steps to encourage Syrian refugees in Turkey to return to relatively safe areas in their native lands. The returns increased after the successive operations Euphrates Shield and Olive Branch. Overall, more than 160,000 Syrian refugees have returned home recently through border crossings. The charity also has been working on the improvement of the tents in refugee camps as well as people's health problems in different zones of the country. Highlighting that two district hospitals with 200 beds each have been built in the Syrian town of Al-Bab and in the Çobanbey district of Kilis province on the Turkish-Syrian Border, Kınık added "The hospitals are going to be open to serve soon. In addition to this, we keep working to fulfill the blood need." The Turkish Red Crescent and the United Nations Office for the Coordination of Humanitarian Affairs (OCHA) signed a cooperation protocol in June to help the internally displaced in war-torn Syria. Under the protocol, the U.N. agency will deliver $2.3 million this year to the Turkish Red Crescent for the latter's humanitarian efforts in Syria.